Her concertante repertoire includes: « St. John Passion », the « Christmas Oratorio », and the « Magnificat » by Bach, « Susanna » and « Messiah » by Handel, Beethoven's « Ninth symphony », Brahms A German Requiem, Bruckner's « Te deum", Dvořák's « Stabat mater », Mendelssohn's « Elijah », Mozart's « Requiem » and Rossini's « Petite Messe Solennelle » as well as modern works, including « Mysteries of the Macabre » by György Ligeti and « Trois airs pour un opéra imaginaire » by Claude Vivier. For Marie-Pierre it's important to take part of the creation of contemporary music: premières she has given include of « Hin-Nun » by Younghi Pagh (German première) and « die Tränen der Eos » from Volker Ignaz Schmidt (world première). In 2014, Carus released « Warum toben die Heiden », a CD of cantatas by G.A. Homilius featuring Marie-Pierre as soprano soloist. The intensity of the recording process in this highly concentrated work corresponded perfectly with Marie-Pierre's musical abilities and disposition, although she prefers the contact to a live audience. For that reason she is a devotee of the operatic stage, where she has sung Nannetta in Verdi's « Falstaff », Eva in the German Premire of « Paradise reloaded (Lilith) » by Peter Eötvös, The Crowd, The Child, and The Stranger in « Into the Little Hill » by George Benjamin, The Queen of the Night in Mozart's « Magic Flute », a Flower Maiden in the world première of « Mondparsifal (Ersatzmutter der Abwehr) » by Bernhard Lang, and the titelpart of « Schneekönigin » by Marius Felix Lange. Mixing different genres of art is an important interest of Marie-Pierre's. She was a performer in « Wardian Case » at the « Eclat » Festival in Stuttgart and has sung concert pieces not usually staged, including « Poslanija pokojnoj R. V. Trusovoj » by György Kurtág, Orff's « Carmina Burana », and Mendelssohn's « Elijah », the latter in the Friedenskirche in Potsdam. Marie-Pierre is always searching for new challenges, expressing her joy to sing, an attitude which has won her awards: in 2015 the Melody and Audience Awards at « Symphonies d’automne », in 2016 the Bronnbach Foundation Prize at « Debüt », in 2017 the Critics' Award at the « Beppe de Tomasi » Competition, and in 2018 the Audience Awards at the « Bazzini « Competition, the third Prize at the « Francesco di Paola » Competition, and the second Prize at the « Jole de Maria » Competition. 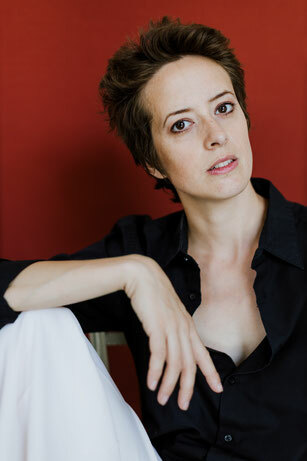 Marie-Pierre Roy has worked with music directors such as John Axelrod, Sylvain Cambreling, Gabriel Feltz, Gabriele Ferró, Claus Peter Flor, and Simone Young and theatre directors such as Roberto Andó, Andreas Bode, Stefan Huber, Helen Malkowsky, Jonathan Meese, Jenke Nordalm and Bernd Schmitt. She has performed at the opera houses of Chemnitz, Dortmund, Naples, Rijeka, the Teatro Massimo in Palermo, the Teatro de la Maestranza in Sevilla, the State Theatre, Kammeroper, and Theaterhaus in Stuttgart and the Theater an der Wien, as well as in famous cathedrals such as those of Strasbourg and Naples, and in prestigious concert venues such as the Liederhalle in Stuttgart, the Gewandhaus Leipzig and the Verdi auditorium of Milan.